Growthdeck | Your invitation to become a Growthdeck shareholder Capital At Risk. Growthdeck is now three years old. We have learned so much over that time, from establishing and fine-tuning our proposition, identifying the investors that value how we work, to building trust with a rapidly expanding network of introducers, experts and entrepreneurs. We have already exceeded our fundraising target, but would like to allow for confirmation of significant outstanding interest. This will be the final close, so please make your reservation as soon as possible. And after nearly £15m raised for 15 companies, we now see the signs of growth that indicate we are approaching a tipping point - from which our business will begin to truly fulfil its considerable potential. To allow us to scale up our business, we are now seeking up to £2.5m of new equity capital. This opportunity is EIS-qualifying, meaning that investors receive 30% income tax relief on the cost of their investment. Existing Growthdeck shareholders and management have already contributed a significant amount towards our fundraising target. It demonstrates the strong belief everyone has in the potential of our business and our ambitious growth plans. In addition to buying Growthdeck shares, investors will also be granted virtually free shares in each company for which we raise funds. Over the next 3-4 years, Growthdeck shareholders can expect to build a portfolio of dozens of stakes in our companies at almost no cost. You can find out more about this in the Information Memorandum. 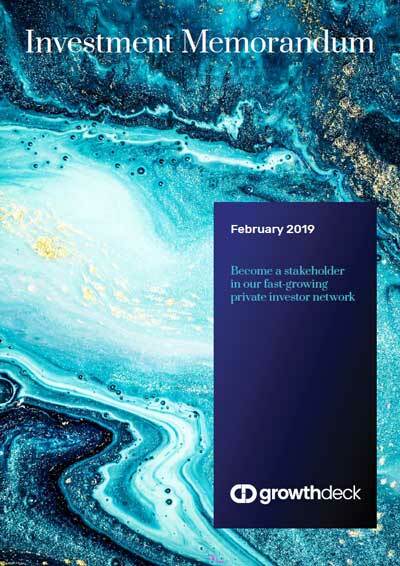 This fundraise should be our last and will enable Growthdeck to establish itself as the pre-eminent private investor network in the UK and ultimately beyond. We would, of course, be delighted if you became a Growthdeck shareholder and benefited from our future success. Please join the network or log in to view full details and to access the Investment Memorandum. Clicking this button is not a commitment to invest.